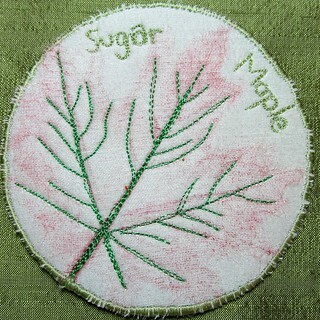 I made a rubbing of the leaf with Pentel dye sticks onto silk organza. The Pentel dye sticks feel like Cray-Pas – a kind of waxy pastel crayon in deep colors. Then it looked like the dye stick was holding onto the leaf so I added some more and ironed it off onto the base circle where it made a faint leaf impression.